Can Anyone Read the Writing on Your Blog? I make my living as a freelance copywriter, which is why many people won’t play “Word With Friends” with me. They figure I must know dozens of long and esoteric words. But I believe my success depends on my limited vocabulary of words more than six characters or three syllables. Why? Because keeping it short and simple makes writing more understandable, whether it’s a blog, an ad or an article. I’m not trying to impress my readers—I’m trying to inform, persuade and entertain them. And the way to do that is to write so that they can quickly grasp the message. It’s easy enough to check if you’ve succeeded: All you need is a readability calculator. Check online and you’ll find a selection of free calculators, including those from Online-Utility.org and Simple Measure of Gobbledygook (SMOG). 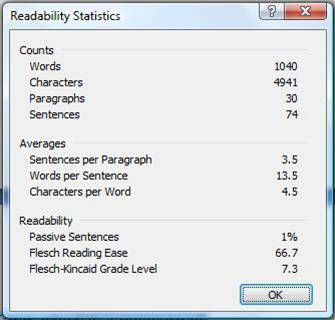 But if your program of choice for writing is Microsoft Word, as mine is, you have readability scores built in. You probably run Spelling & Grammar to check your blog before posting it for the world to see. (If you don’t check your blog, we have another issue entirely.) Just make sure that in the Spelling & Grammar tab, you tick the boxes to Check grammar with spelling and Show readability statistics. Then run the check on your words. The example here shows the results from the blog you’re reading right now. After Word confirms that, yes, I could still win a spelling bee and, yes, middle school English paid off, you’ll see the Readability Statistics pop up. The numbers don’t necessarily make intuitive sense, so you make be tempted to ignore them. Don’t! Take a minute to find out what those digits mean. 2. Check the Flesch-Kincaid Grade Level. Being contrary, I tend to look at the last section—Readability—and the last number first. The Flesch-Kincaid Grade Level shows this blog at 7.3. Looks like the average U.S. 7th grader can understand what I’ve said. That’s perfect. Middle schoolers may not be my usual target audience but—according to the National Adult Literacy Survey—most U.S. readers will trip along happily at about the 8th grade level. Often I look no further than Grade Level. If that’s good, all else tends to fall in place. But if the Grade Level runs over 10, I explore the other indicators. The number hovering above Grade Level is Flesch Reading Ease, which is a measure of understandability based on average sentence length and average number of syllables per word. A score of 100 is as easy as it gets. Our goal is 60-70, and we’re on the mark with 66.7 here. Unless you’re a politician, skip the passive sentences. They weigh down your writing and wear out your readers. Note that for this blog, passive sentences register a paltry 1%. For a short piece, that’s exactly what I want. In a longer piece—an article or case study, for example—I might allow a few passive sentences, but still not many. Now what if the Readability numbers didn’t look quite so stellar? For example, I recently edited a case study with a brain-numbing 14.8 Grade Level. I can guarantee most members of the target audience hold advanced degrees, but that doesn’t mean their eyes won’t glaze over before they glean the valuable content. To bring that Grade Level down into the high school range, I cast my editorial eye on the Averages section. In the example here, the Sentences per Paragraph is 3.5. 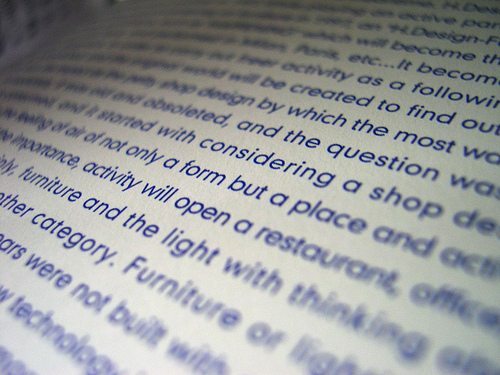 If you recall the rules of paragraph structure, each should encompass a single idea. The challenge is to determine when you’ve used up that idea. I cut off the ideas fairly quickly to deliver punchy, precise prose. But I also cheat a bit: Often I bold the first sentence in a paragraph instead of creating a separate subhead. Then I make the bold pieces flow together to tell a story. That works really well for readers who would more accurately be called skimmers, so I give myself some leeway on the Sentences number. Next take a look at the Words per Sentence. Here I’ve got 13.5 words, which works fine for a blog. To produce the greatest impact, you’ll often see much shorter sentences in ads—but unless you’re Hemingway, that will seem a bit choppy in a blog. So aim for clear, direct sentences than run 15 words or fewer. Finally I look at the Characters per Word. My blog’s petite words average only 4.5 characters in length, well under the suggested 5.0 limit. Don’t use a longer word when a shorter word will do. You don’t get extra points for using pulchritudinous instead of pretty. But do use a longer word if it’s the specific meaning you want—and your readers will understand it. That’s especially relevant for techie writing, where it can be challenging to keep the Characters number low. If you’re truly discussing the concept of ubiquitous communication, then use that term. Otherwise go for something simpler. I tend not to look at anything in the Counts section unless a client gives me specific limits. But Glen at ViperChill analyzed the most tweeted posts and determined the average length runs around 1100 words. That said, write as long as you need to add value, then stop. At 1040 words, I’m done here. Guest Author: Diana Kightlinger is a writer and marcom consultant for high-achieving businesses, from solo entrepreneurs to Fortune 500 companies. As principal of Eclipse Communications, her focus is on results. You can find out what she’s thinking about on the How-To and So-What Blog.